How Is Density Affected When Air Bubbles Are Trapped Under a Solid in a Graduated Cylinder? A science investigatory project, also known as a science fair project, requires a student to ask a question, form a hypothesis, test his hypothesis and then present the results in either a paper or display-board form for examination by the teacher, fellow students and/or a series of judges. An appropriate topic for investigation by a middle school would be the effect of acetone on Styrofoam. Acetone is a volatile and highly flammable chemical. All experiments should be performed in a well-ventilated area, preferably under an exhaust hood, if available. Wear protective eye wear at all times. Dissolving polystyrene releases a gas in the form of bubbles that may cause the acetone to splash. If you splash any acetone on your skin or in your eyes, rinse thoroughly with water. Styrofoam is the trademarked name of the plastic foam polystyrene. Polystyrene is not biodegradable and resists compression, making it a persistent part of landfill waste. When acetone and polystyrene are combined, the polystyrene dissolves. For the investigatory project, the student could explore the effectiveness of acetone in reducing polystyrene for recycling. The student could measure how much polystyrene is dissolved by a particular volume of acetone. Each science fair project should be grounded in previous research. Research polystyrene and its effects on the environment at websites like the United States Environmental Protection Agency, Earth911 and Earth Resource foundation. In addition, look for previous experiments relating to polystyrene and acetone or other solvents. 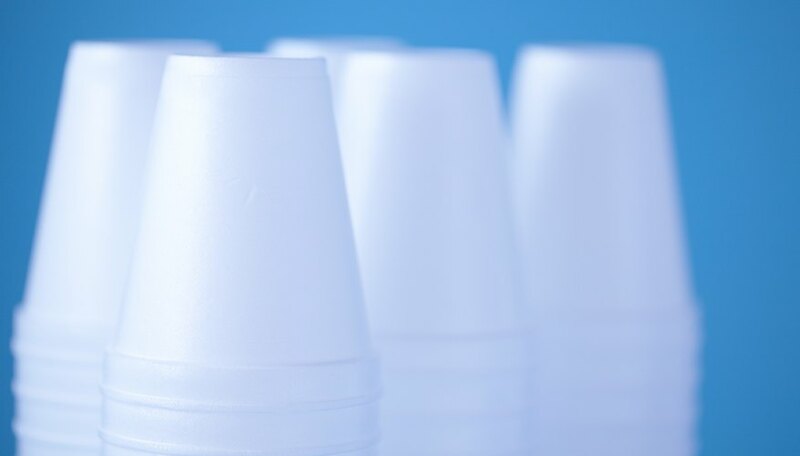 For example, the University of South Carolina published an experiment on their website studying the effects of various solvents on polystyrene, including acetone. Dissolve Styrofoam cups in a series of 500-ml beakers containing increasing volumes of acetone. For example, fill five beakers with 10 ml, 20 ml, 50ml, 100 ml and 200 ml of acetone. Place a stack of five 6-oz. Styrofoam cups in each beaker and measure the amount of time it takes for the stack to dissolve. Continue adding one cup at a time to the acetone until the acetone no longer dissolves the cups. Repeat the experiment three to five times for each volume to get an average time and an average number of cups. Weigh the beakers containing the acetone before you begin adding the cups. Weigh one Styrofoam cup; weigh the beakers after you have dissolved the cups. Report your results as well as any conclusions you draw from the results. For example, do your results suggest that the volume of acetone indicates how quickly the Styrofoam dissolves? Does the volume of acetone affect how much polystyrene can be dissolved in a single beaker? Does dissolving polystyrene in acetone add to the weight of the beaker, and does it match the weight expected by the number of Styrofoam cups added to the beaker? Many teachers or science fair rules require you to suggest additional studies. For example, would the application of acetone or another solvent to an existing landfill dissolve any polystyrene present beneath other garbage? How much solvent would it take to penetrate 1 foot of garbage? Does the residue of dissolved polystyrene affect the biodegradability of the surrounding matter? Watson-Price, Erin. "Science Investigatory Project on Acetone and Styrofoam." Sciencing, https://sciencing.com/science-investigatory-project-acetone-styrofoam-8709208.html. 25 April 2017.